As the two of you worked with Miyamoto-san on Super Mario Galaxy, I'm sure there must have been times when he did things that made you go "He got me!" How did these things occur? Well, there were a lot of times when the things he did made me feel that he had got me, but this time I was actually the one who upended the tea table12. 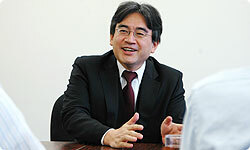 But after I did that, Miyamoto-san came up and said to me "Why did you upend it? It was better the way it was", and realigned the plates back on the table. 12 This is a reference to the classic Japanese comic and animated series, Hoshi of the Giants. The father in the series once upended the tea table when the family was eating their meal there. Shigeru Miyamoto's working style has been compared to this because of his tendency to make last-minute suggestions that leave everyone else scrambling to implement them before the deadline. Shigeru Miyamoto clears up the tea table. You often hear of Miyamoto-san helping others to clear up the tea table after he has upended it. There are so many cooks who try to order new ingredients when something goes wrong while they're making a game. But with Miyamoto-san, he tries to combine two ingredients that don’t work on their own to make a dish that works. He really doesn't put any of the ingredients to waste. Him doing so was really helpful. It makes the person who made the dish in the first place feel a lot better, too. 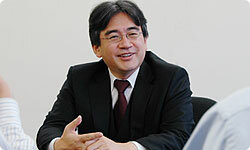 By the way, Iwata-san, ever since the DS and Wii were released, you keep mentioning how to make games that can be enjoyed by anyone, from age 5 to 95. Hearing that, we really put in the extra effort to make Super Mario Galaxy a game that could be enjoyed by anyone as well, from age 5 to 95. So in order to make the game so that anyone can play it, we made the game very easy to clear during the early stages of development. 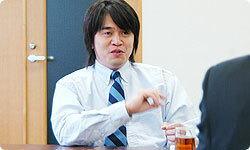 However, when Miyamoto-san tried that version out, he said that it was too easy, and lacked intensity. I often hear him say how a game must not lose excitement for the sake of making it easy, and that a game needs to be easy, yet be intense at the same time. This actually leads to what we talked about earlier, about how we put a limit on how often you could spin. Since we're talking about the intensity of the game, I placed a rather bold suggestion for this game. I wanted to change the life meter’s maximum to 3. With this, Mario ends up losing more lives as a result, but at the same time we increased the number of 1-Up mushrooms that are available throughout the game, and created checkpoints. In Mario 64, the life meter’s maximum was 8. That meant it was rare to lose a life. The life meter’s maximum was also 8 in Super Mario Sunshine, but I felt that the life parameter didn't really tie in to the intensity factor. Even when you find a 1-Up mushroom, you don't think much of it. So this time, we changed the life meter’s maximum to 3, and it became a lot easier to lose a life, but you could get more 1-Up mushrooms to compensate. The fact that the intensity factor changes according to whether the life meter is set to 3 or 8 is representative of the things that players do not notice that actually change the gameplay dramatically. Thinking about all of these elements, with the addition of Iwata-san’s "from age 5 to 95", I really struggled as to how I could bring that intensity into the game. During the development process, my message "from age 5 to 95" must have been a challenge for everyone among the staff. 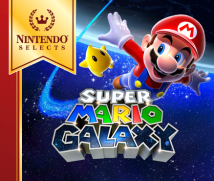 Though many games were created because of this slogan, at the same time I understand that this was a difficult challenge in the development of Super Mario Galaxy. But the Co-Star feature was born as a result of this struggle, and in that sense, I feel a firm conviction that the game will help greatly expand the range of the gaming audience. And now to wrap things up, if I could get both of you each to say a few words to our readers about the game. Fundamentally, I think a Mario game is the type of game that's really not about completing the game, but rather about having fun just playing. So, I made sure there were lots of areas in the game that could be enjoyed, even by little children, just by moving Mario around. In these places, you don't have to think about what you have to accomplish, so you can play around freely. I hope people who will play this game will find a special place of their own in the game, and discover their own way of enjoying the game. 22 years ago, when the first Super Mario was released, there used to be many more people who would gather around the TV. The Famicom (NES) console would be connected to the TV in the living room, and a crowd of friends and family would gather around the player. The crowd would also enjoy the game play experience, and eventually the spectator would be trying to grab the controller away from the player, saying "It's my turn!". In truth, well-made games share a common quality where it's fun just watching the person play. Since Wii is connected to the living room TV, I would love to see someone having fun watching the person play, where they would then jump in the game using Co-Star mode, and the next thing you know, someone who does not usually play games would find themselves playing Super Mario Galaxy. Right, we made the game hoping something like that would happen, so I would like for as many people as possible to have fun with the game. Thank you very much. Next time, I would like to talk to the younger developers in the Tokyo office.